Relying on God is a challenge, relying on humans is an even bigger challenge. Ninety percent of ministry work relies, supposedly on God, but in reality on humans donating money. However, humans and money have many challenges. Economic crashes can, and will, dry up people’s ability to support or donate to a ministry. Job loss, forest fires, health challenges, and other natural disasters can all remove donated support in an instant. Having all your long-term support eggs in one basket is dangerous, even if it is normal. At the same time, it seems to be a common trap to fall into. One or two churches, in the same geographical area, who support a given local person. And that person relies entirely on those churches, where is God in this reliance? Hopefully front and center, but sometimes perspective shifts and God can end up sliding to the background. 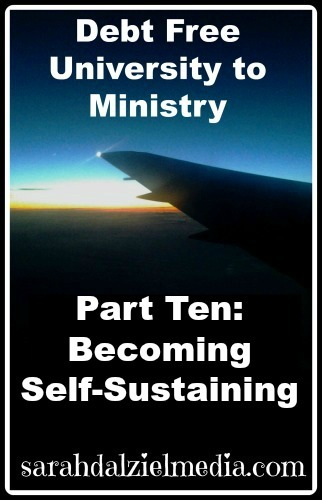 This is part ten in the Debt-Free University to Ministry series. You can find Part Nine here, and Part Eight here (with a linked list of other parts). Call it missions, or ministry, but most likely you won’t be getting paid to do it. However, there is a way to be both self-supporting and in full time ministry. It is called Business As Missions (BAM), or Tentmaking. Now, not all Business as Missions is created equal. Some people use business to hide missions, while others use it to support missions, and still others see their business as literal missions. What I want to focus on is using business to support missions, particularly online business. The web is a sea, with the potential to find pearls, valuables, and many beneficial things. But, like the sea, it also has its share of sharks, jellyfish, and sting rays to watch out for. Also like the sea, you have to expend some resources to be successful. But, usually no one grudges a sprat to catch a whale. Though, in the internet business world it might take a few sprats to get even a salmon, let alone a whale. Internet business has one very strong benefit, you can do it anywhere you have an internet connection. You have likely heard of the laptop entrepreneurs, who travel the world having fun while sustaining their travels online. Well, wouldn’t it be even more awesome to travel the world doing ministry while being self-sustaining online? Internet business income has two types, active and passive. A good internet business model will take both of these types of model and integrate them to make the best use of time, effort, and mental resources. Active income is usually exchanging your skills for money. Alternatively, it can also be the building up done to create the ability for passive income, active blogging, an active social media presence, and active works of creation. Passive income is where you have built an active base, with products, that now basically sell themselves with a bit of added marketing. Ideally, an internet business should move through a very active stage, and then gradually need less of your actually hands-on time, either because you get really good at it, or because you earn enough to hire someone else for the mundane parts. When you are just starting out, grabbing some active income by selling a service you do well, and fast, can help you keep moving forward. Basically adding a few more sprats to catch the white whale. The first type I want to cover in-depth is an active income business. For this, you are selling your services and exchanging time for money. Something like writing, editing, or video design is a good example of a marketable skill for this type of service. You may be selling through your own website, like I am, or through a service provider like Fiverr or Elance. Another example of this business model is where you create a physical product and sell that. Etsy shops, with homemade candles, soaps, or knitwear are examples of this type of model. This model is not limited to the internet. Local craft shows, fairs, and markets also take advantage of this type of business model. This type of business model is a good way to start into the realm of internet business, get used to how people act, and gain experience. However, this type of business is not reliably scalable. You can only work so many hours in a day, and thus your income will always be limited. For someone traveling, whether for fun or ministry, making and selling physical products will not get you very far. Shipping is expensive if you are international, and carrying craft supplies would be nearly impossible. Trading on a skill, like writing, means that you need the time to carry it out. I would recommend this method for someone getting started, or whenever a bit of a support boost is needed. If you have an established reputation and established clients for your online service, it is easy to keep a few jobs going in spare time. This method is one that requires a large initial investment of time and effort, as well as continued effort to make it grow. Passive income is only passive because, once established, you can earn income while sleeping or traveling, without having to be actively hands-on at all times. For it to really be successful, you need to establish some level of authority on your subject or niche. A niched topic is essential, trying to talk about everything under the sun will just burn you out. A website, that you host, and a personal domain related to your niche will help a lot. Determination, because it takes a long time for a blog or website to gain authority, trust, and traffic. And creativity, because once you have traffic and trust, you have to monetize it through your own product. Products, of some kind, are the best form of passive income. However, you have to sell and market them because no one else can do that for you. While you can use other people’s products through various affiliate programs, you will always earn more for your own product. Affiliate programs are helpful, but they require a lot of clicks and buying to make you anything. I’ve been an Amazon affiliate for over a year now, and haven’t yet broken 10$. However, at the same time, affiliate income can be passive income if it’s imbedded into post content. Ad revenue is another form of, relatively, passive income. Based on views, or clicks, you can make a certain amount of income from placing ads on your self-hosted blog. Most viewers are fairly immune to ads, however, and an ad-free blog may end up being more attractive once you are established (use the old ad space to advertise your own products, books, or offerings). Books are fun, nearly everyone likes reading a good book. However, books are like products, they require marketing and effort to sell. However, once you have fans and are somewhat known, you can have books that “sell themselves.” Series are especially good for this tactic, though the first book must be well marketed to feed into the others. The Objections: But Business is Slimy! I have heard many Christians, bloggers and others, decry marketing and successful self-employed businesses as something Christians should not be doing. If they are in online business, they shrink from asking people to buy their product or service. In normal business, many believers will imply that Christians should only be working for others, not being self-employed. Finally, when people are in ministry and want to have a business to be self-supporting they are told that they are “not trusting” God enough. Why is it that Christians shrink from entering business with their whole effort? Why is it that earning money, so that you can help yourself and others, is frowned upon? Many people misquote Paul as saying “money is the root of all evil” when in reality the quote is “the love of money is the root of all kinds of evil” (1 Tim. 6:10 ). But, I am fairly certain that a successful business does not happen if you are only in it for the money. Successful businesses, particularly online, thrive on relationship, trust, and genuine helpfulness. The most successful online businesses I know of are the ones that genuinely help people gain their goals. Two examples of this are Michael Hyatt and Pat Flynn’s Smart Passive Income. Does earning one’s own income mean that one is not trusting God? I don’t think so. We are commanded to do our best, and the “servants” who employed business skills to double “his master’s talents” was commended for his business acumen. Doing one’s best in ministry, or in online business, is all that we can do. We cannot force people to visit our blogs, buy our books, or anything else. All we can do is our best, in best business practices, and leave the rest in God’s hands. In your own opinion, which takes more trust: Relying on a few churches for monthly checks, or relying on God to bring in sufficient income every month for your needs from a variety of sources? One final argument against self-supporting ministry is that it prevents others from joining with you in your ministry endeavors. And, that others are blessed when they donate to your ministry. However, Paul and Silas never asked for donations to fund their ministry trips. They worked and sustained themselves as tentmakers. So, what model should we be following, that of the modern mission’s movement, or that of Paul and Silas the first long-term missionaries? Personally, I love the idea and practice of “tent making” and the only thing I want to bother my local churches about is prayer support. Why? Because prayer is the “WD-40” and “Duct tape” of the Christian life, and mission. What do you think about someone doing missions and being self-supporting? Would you do missions if you were self-supporting?